Do you ever find yourself on a path with no direction? A strategic plan may be what you need to put you on the path to success. A strategic plan is essentially a road map for an organization’s program and goals. Transform Consulting Group helps programs develop their strategic plans with our 4 step process, which you can read more about in a previous blog. This blog focuses on step one in the process: Collaborate. We pride ourselves on step one, collaboration, to work with our clients and not for them. During the strategic planning process we work with you to identify the appropriate key stakeholders to inform the planning process. By engaging diverse stakeholders in organization’s planning process we not only help to increase buy in and ownership from those key stakeholders but also solicit rich feedback to inform the final plan. This is a common method to use but to get really great feedback from surveys you need to hone your approach of how you administer it and the types of questions asked. When creating a survey, consider the audience. For example, if you plan to survey youth, assess the reading level of the questions to make sure it is developmentally appropriate. While you are considering the audience, think about the best method to share the survey. Is there a time when the audience regularly meets when a survey could be shared and collected in person at a meeting? Is the audience a broad community group making it difficult to reach the audience in one place? You may need to connect with community resources to distribute the survey. We have partnered with the local economic development group to share online surveys to get local employer feedback. Once you have determined the audience and the best way to distribute the survey, decide the most effective platform to create the survey. Platforms include printed copies or electronic. Electronically, we use SurveyMonkey, but there are several free, online tools available. If you want to get more in depth feedback beyond basic survey questions, a focus group or listening session may be the appropriate tool. Create guided open-ended questions that prompt conversation during the focus group. Again, identify if the stakeholder group has a regular meeting time when you could be added to the agenda to ask some questions and gather their feedback. We have done these at conferences, community meetings, and parent councils just to name a few. Focus groups can be done in combination with surveys. We’ve done focus groups first to ask broad questions to a small group that will then inform a survey that goes out to the large group. We’ve also done focus groups after a survey to go deeper on the some of the questions asked in a survey. There is often a community member or business leader with expertise around the area of a strategic plan. If they are not already a part of the planning process, invite them for an interview to gather feedback and information related to the strategic plan topic. The stakeholders for individual interviews are typically people who have deep history, knowledge, experience or stake with the organization. Similar to the focus group, outline open-ended questions, but leave room for unguided conversation as well depending on what they want to share. Some stakeholders are key decision makers and influencers in the community. Bringing them to the table throughout the process will help keep them informed to know how to better share the message and goals of the strategic plan. They will also be able to bring a different perspective from those within the organization, which helps avoid groupthink. You could invite these stakeholders to one of your planning retreats to unpack all of the data and feedback collected and assist with identifying the key goals and strategies. To get more ideas about how to collaborate on a strategic plan, look at other successful organizations. 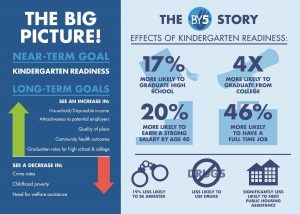 By5 is a leading organization for early childhood awareness in Muncie and Delaware County, Indiana. They have created a strategic plan through the collaboration of task force and volunteer efforts to improve the developmental opportunities for children ages 0-5. 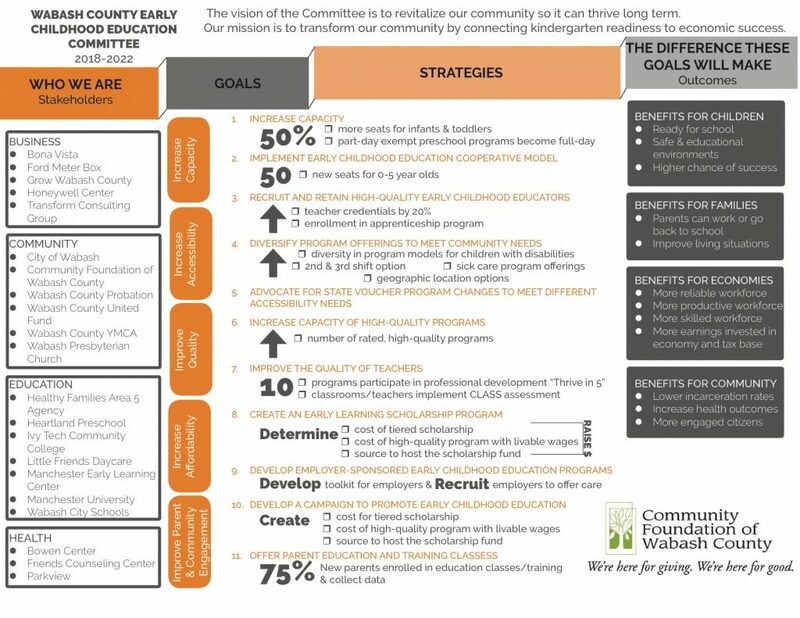 When we were working with the Community Foundation of Wabash County to create a strategic plan for their coalition focused on early education we benchmarked other communities for lessons learned and strategies. Once the key stakeholders are identified and tools have been distributed for feedback, move onto step two, Assess. Follow our blog posts to find out effective methods for assessing your organization and community to inform your strategic plan. Contact us today to learn more about our strategic planning process and how we can work together to identify the appropriate key stakeholders and tools to inform the planning process.